Our professionally-trained student-athlete Hollywood movers are ready to get you into your new home. 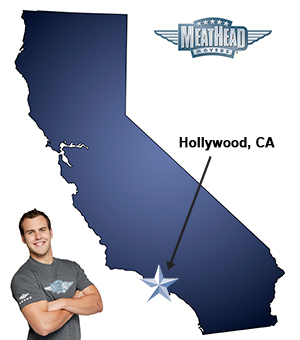 For a trouble-free move to or from Hollywood, Meathead Movers is the company for you! Tinseltown. Hollyweird. Land of Dreams. So much has been written about Hollywood that it’s difficult to separate fact from myth. It is, after all, the place where movies are made, where fantasy becomes reality, where stars are born, dreams are given flight, and where the best Hollywood movers are unequivocally Meathead Movers. Most Americans can name dozens of movie stars who have made their mark here over the last century. Pickford. Barrymore. Davis. Bogart. Brando. Roberts. Hanks. Jolie. Clooney. But who’s H.J. Whitley? A Canadian immigrant, Whitley is known as the Father of Hollywood. He helped develop some of the area’s first housing developments, the famed Hollywood Hotel, and the Kodak Theater. Since then, Hollywood has blossomed to the successful movie city that it is known as today. The name Hollywood has now become synonymous with glitz, glamor, and the glorification of motion pictures. Although not a city (Hollywood is actually a district of Los Angeles and has no separate government), it’s widely believed to be one, and nearly 125,000 people call this area home. As a resident, all the famous, iconic Hollywood sites will be part of your everyday scenery: The Hollywood Walk of Fame, CBS Television City, Paramount Pictures’ back lot, the Capitol Records building, the Hollywood Bowl, Grauman’s Chinese Theater, and of course, the celebrated Hollywood sign on Mt. Lee in Griffith Park. If you are considering a move, Meathead Movers is here to help! Our moving company specializes in local, long-distance, and commercial moves to, from, and within California. We also provide reliable packing, storage, on-site relocations, and our distinctive moving concierge service. Our highly-trained, motivated, polite and well-groomed student-athlete Hollywood movers are recruited from local colleges and universities. They treat your household goods as if they were their own and they jog while not carrying your items to save you valuable time and money on moving day. Call our Hollywood movers today for a fast, free estimate for you upcoming move, and make your dream of a hassle-free move come true. With our 100% satisfaction guarantee, the only thing you have to lose is the stress that comes from moving! Moving to Hollywood? Here are some helpful resources. Outstanding from the first visit with your representative to the last item off the truck. My team of Deionte, Jake S, Alex P, and Josh D were exemplary beyond my dreams!! Extremely courteous, very willing to do absolutely any request, incredibly careful with all my mirrored furmiture(God bless them), and just all around nice guys! My move was flawless without any damage whatsoever. Best move I,ve ever had. I will be happy to rave about them to all friends and family!! although i was not there my daughter was pleased with the move..i have a question? did the maid serve stay for the time paid for... i thought they were going to be there for 3 hours? not sure if they were. i have not been able to talk to her at this time. she says she has a lot of unpacking to do and i thought that is what i paid for... please check this out and let me know how long they were there. Everything you promised was done! The movers were prompt, courteous, and took very good care of my belonging. Everything was very well organized from start to finish for my move from Hollywood to Palm Springs. I thought the price was fair, the address change notification services are a big help, and the movers - headed by Marc Neuman - were on time, efficient, and really great guys. I was very impressed with everything.